Campaigners in Southall are intensifying their opposition to the disposal of their Town Hall which, while surplus to the Council’s needs, is used locally as a crucial resource that provides a centre for community groups supporting those on the margins of the Borough’s society. Southall Town Hall dates from a similar period to the Ealing Town Hall. It was built at a time of civic pride and a belief in local government’s role in enhancing the welfare of local people. Such ideals have sadly been lost sight of as the Council has embarked on the fire sale of its assets, heedless of the consequences for those who depend on them. 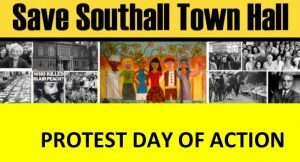 Campaigners are organising a Day of Action this Friday, February 9th and will assemble from 2-4pm at Southall Town Hall. Please join them if you can. ← Ealing Town Hall – WILL THEY, WON’T THEY?